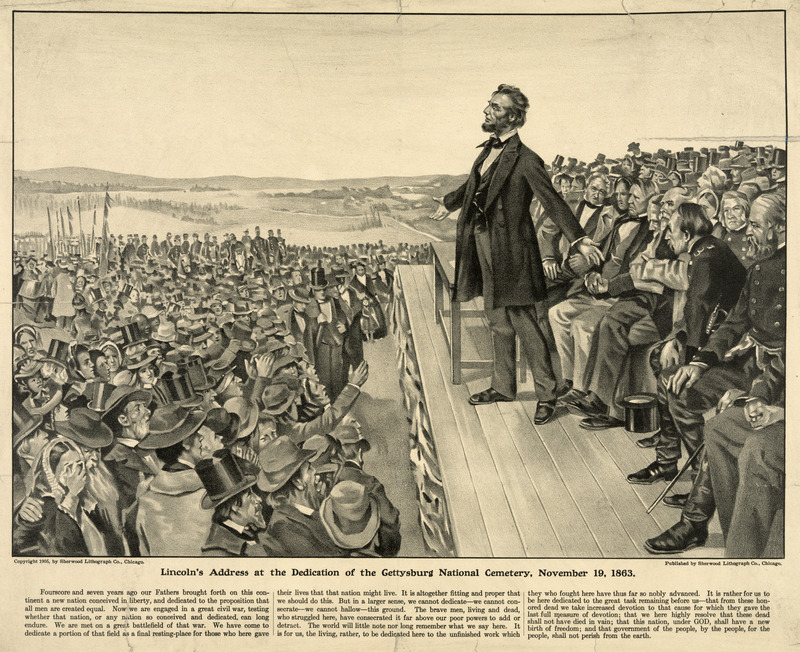 Years later, Lincoln’s Gettysburg Address inspired the historic Under God sermon that was preached on Lincoln Sunday, February 7, 1954, by Dr. George M. Docherty at Lincoln’s Church, the New York Avenue congregation. Dr. Docherty noted “there was something missing” in our Pledge of Allegiance, and that was “under God." President Eisenhower was in attendance. The President immediately prompted Congress to pass legislation adding the wording “under God” to our Pledge of Allegiance. So Lincoln’s need for God at Gettysburg led to the addition of “under God” to his Gettysburg Address and, later, to our Pledge. Lithograph print. Published by Sherwood Lithograph Co., 1905. From the Library of Congress, LC-DIG-ppmsca-19926.